Weariness Is Wearing Me Out! I am certainly no icon of physical fitness or robust health, but I have learned that life is best lived rested. Too much, too long, too hard are generally signs that we need to recalibrate. Though weariness cannot be avoided—that would constitute a wrong goal—all weariness does not fit into the same category. “Come to Me all you who are weary and burdened, and I will give you rest” (Matthew 11:28). This sounds like a spiritual spa experience, but too often we overlook the supernatural power of consistently spending time alone in His Presence. To stand under the waterfall of His grace works wonders even when nothing else in life changes. Fresh air is a gift to our psyche and it is nearby, uncomplicated, and economical. Don't overthink this; just spend time outdoors for refreshment. A good night’s sleep is always at the top of the list. Go to bed earlier than usual for several nights in a row, and tell weariness to take a hike. 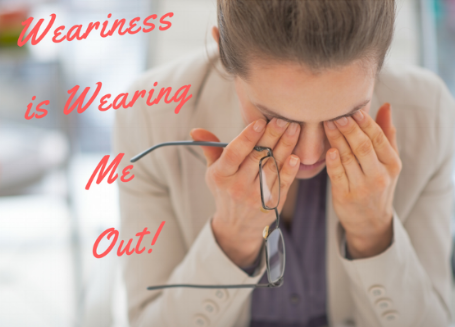 Where in your life are your experiencing a healthy reason for weariness? Likewise, where in your life do you discern an unhealthy reason for weariness? What one step forward is needed for both situations? Jesus says, “I have come that you might have life and that you might have it more abundantly, that it might be full and meaningful” (John 10:10). How does this take weariness into account? Newer PostWhat Did You Say? Older PostWhat Are You Doing Here?